Mia was born in the mountains, and now lives by the sea (b. 1988, Canada). Her practice spans the disciplines of contemporary art and design research, both intertwining and obscuring these expansive, complex and vibrant landscapes. Traversing a social aesthetic of precariousness, chaos, impermeability, and intimacy becomes a practice of embracing fragile infrastructures and adaptability – creating an openness to knowledge and meaning, while celebrating the often contradictory nature of differing value systems and the expansive pluralism that characterizes contemporary life. An on-going and open-ended narrative, Mia investigates the (and/also) simultaneous poetics of Belonging: the reciprocal exchange and responsibility, intimacy and amplitude, myth and memory, body and landscape, reciprocity and exchange within contexts of the individual and the collective, local and global contexts. 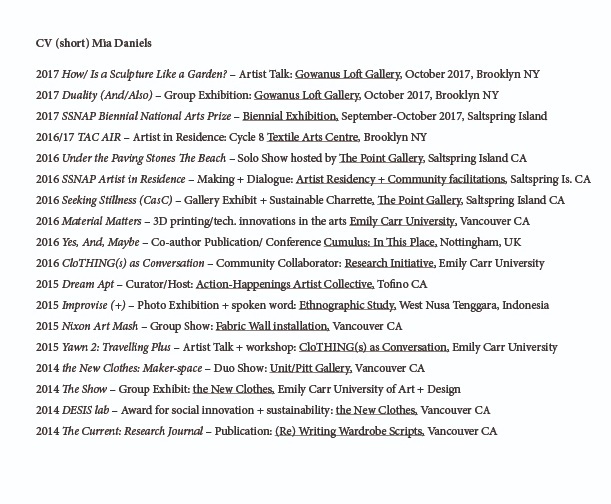 In 2016 Mia was awarded two residencies, SSNAP AiR (Saltspring National Art Prize) in Canada and TAC AIR (Textile Arts Center) in Brooklyn, New York, exhibiting in Vancouver, Saltspring Island and New York City in 2017. Mia was selected as one of 30 national finalists to exhibit in the 2017 SSNAP Biennial. Currently, Mia lives in a remote community on the West Coast of Vancouver Island, Canada, where intentions/ actions are traversing An Ethical Art; A Social Space: the embracing of chaos, impermeability, and an openness to knowledge and meaning (precarious syntony; amplified empathy; speculative object).